Officially 2012 Summer's here. Winter ends, and the sub-continent summer starts from 1st March ! In our region, the summer season starts from down South, and as explained before, slowly creeps its way Northwards during the course of the month of March. Well, this year, this process started quite normally and almost on schedule, I would think. Except for a lone 40c at Bhubaneshwar, no other place has touched the 40c mark. But, officially yes, 40c has been acheived. An important parameter to observe this year is the weakening La-Nina. La-Nina has been the factor behind the good flow of W.D.s (during March) in 2011, and subsequently the good SWM. This year, 2012, as yet, the La-Nina effect has kept the W.D.s coming. Now, we are seeing a weakening of the La-Nina event. The SOI has dropped drastically in the last 8 days, and the neutral level could come as fast as by end March.This may restrict the flow of W.Ds and increase the heat in the sub-continent. If neutral conditions remain, we may be spared of extreme heat this summer. We can recollect, that in 2010, we had the onset of summer about 10 days ahead of the normal date. And by 1st. 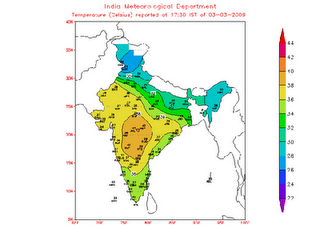 March 2010, as the IMD map shows, the heat has already moved more than half way into India.And most of the country was in the "above normal" range. We also see the "above normal" area engulfing large portions of the country, more so the central areas. Even 2009 had an early start to summer. An IMD map of 1st March 2009 reads the picture. Across the border, days are heating up very gradually. Places in Sindh, the regions heating up initially, are in the 33/34c range. Low compared to 2009 and 2010 when certain cities had shot up to 37c then. Dear Global Warming Alarmists: We're Still Waiting for Declining Snowfall...more on Global Warming Hysteria Page. Yes, the summer is officially here; but its yet to creep as far north as Kathmandu. After an initial flare up of temperatures in the last week of February, now the temps are down to moderate levels - yesterdays temps : min 4.5 C and Max 23.8 C. I guess it'll start to rise slowly now, by next thursday the max should be around 28 C ; what say ?? ?